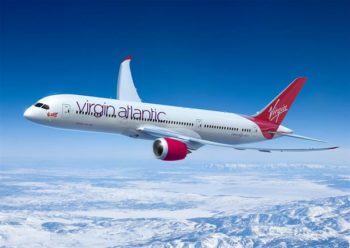 Virgin Atlantic has launched a Spring Sale with deals to the US in Economy and Upper Class. Until 19th April you can find reduced fares on flights to the US from London Heathrow and Manchester. Looking at the Upper Class deals, the cheapest offer looks like London Heathrow to Boston at £1,914. This is available to book until 19th April, as long as you book 120 days in advance and include a Sunday night. To get flights at these prices you generally need to book at least 60 days in advance, travel in July or August and include a Sunday night. Here is our last review of Virgin Upper Class and here is our last review of Virgin’s Clubhouse lounge in Heathrow Terminal 3. Virgin’s official Upper Class website is here. You can read more about the new A350 Upper Class seat here although this won’t be available until at least August – and even then it will only be on selected Heathrow to New York JFK flights for now. All fares need to be booked at least 28 days in advance and include a Saturday night except for Seattle which needs to be booked 120 days in advance with a minimum stay of 7 days. Here is our review of Virgin’s new Economy Delight product, and this is why the maths says you should book it. You need to book these deals by 19th April at the latest, but there is limited availability and it is worth jumping in now if you want to secure key dates. I noticed that myself a few days ago! A sly devaluation. I wonder how much the BA ‘taxes’ will increase by? £870pp!? I was justifying the £500, absolutely no way I can justify £730. Shame really. One ways are alot more expensive than returns ,maybe to deter the miles rich Americans? carrier imposed surcharges now £500! , and taxes £264 on a dummy return to Miami. Could you run an article on this please Rob? Let a wider audience know this is ridiculous. I guess with that increases in YQ we know how VS are helping fund those A350s from London. I wonder if BA will follow suit. BA led the charge so far as we can tell. Kind of a stealth devaluation. For some strange reason Alex Cruz in his yellow hi-viz was missed announcing this. BA charges to the US have gone up from about £550 last year to about £665 currently. I’ve just started collecting VFC miles again, but with fees that high I will probably end up converting them to Hilton. Before you do that, take a look at some of their partner redemption offers. I gather there are some sweet spots around thé world. … but seemingly correct, which makes no sense at all. NYC is showing as £764 – unless you fly Delta, which is £464. 27 Oct to 12 Dec is the available travel window to Orlando in the sale not the school holidays 🙄. Rob I think you need to clarify this as you wrote to the 31st in your article which isn’t so flexible. Thanks. Virgin sent us duff data it seems. seems their making a consistent habit of that..
OT I can’t find the answer anyway. The 2 for 1 companion voucher with the virgin credit card, can it be used open jaw like the BA one? Ie into one US city and out of another? Yes – I had a VS CS member of staff confirm that to me last year when I redeemed our 2 x 241 vouchers (although I ended up doing a straight return in the end). Great to see a VA sale! or refer for Green and upgrade to Plat? I don’t see any reason for having more online accounts unless they dont let you register them on the same account. Surely you would want your MR cards to be in the same MR account so you keep them flexible while you are holding an MR card? Apologies, am I missing something here? £1,914 to BOS? £2,704 to MIA? Crazy if these are considered decent prices. well if you can show us where to get upper class/business seats in high season to boston for less then we’re all ears/eyes. if you cant find a lesser price without going around the houses then yes it is a decent price. I’ve flown sub £1K from Manchester UC, so……. Of course it is possible to show and have Business Class seats to the US for 1,200 return, and not necessarily ex-EU. I have located ex-LHR with a long-ish stopover (few days) in one European capital. I always think that when I see sale prices, either BA or VS. But that’s because I compare them to Ex-EU offers that often are only available for a few days. I’m just not going to pay £2K for a flight, hence most of my USA trips are with BA, VS rarely as cheap. Unlikely to go down as you are travelling in the school summer holiday period. Interesting. I still get points for OTA bookings as I’m a regular and hotels want to keep the business. So effectually some hotels are unofficially already supporting this. I wish the big chains would simply offer the best prices on their web sites. I’ve had plenty of stays with Marriott and Hilton in recent years, but it’s been 7 years since I booked directly instead of through an OTA. The article says all classes, but the VS website makes no mention of PE. So which one is incorrect? Looks like there are no PE deals, sorry. We were working off info provided in advance. I also know that VS have form for not making it easy to see sale fares that are loaded, not that they tell us that they are. Is it intentional? Given the niche strength of Virgin PE product (comparable to Norvegian front cabin, etc) — no sale? PE is in limited supply and usually 100% occupied (genuine business plus say operational upgrades from Economy), which somewhat reduces its proposition. Hi. Would you not be better off buying 140,000 miles (inc 40% bonus) in the current Sale for £1515 and taking a reward flight in UC say to NYC for 115,000 miles (or 95,000 off peak)? Plus carrier fees and tax? Yes. As Leo says the fees and charges, plus a little tax. Also on the redemption you’ll earn no miles or tier points as you would from the cash fare. Interesting though as (now I’ve looked!) some dates in August fees and tax are only £464 so if you bought just enough miles = 83000 (+ 40%) = £1260 plus £464 it still beats the £1939 price? Availability of redemption seats will be an issue at peak times. is not an interesting proposition to collect miles — even if we are talking collection vs purchasing the miles. You are paying close to the full market prices, which is definitely not “a deal”. OT – no bits – If I book a BA 241 in business and later F becomes available, can I phone up and get upgraded for some extra avios plus £35 pp charge? Yes. There may also be a difference in taxes/surcharges you have to pay for. Yep, ive been checking every day for my flights this weekend to Miami but no luck…. You might find something opens up between 72 and 24 hours before departure, worth checking right up to the wire IME. But in some positive BA news – we have 2 separate bookings as used 2 x 241s, and no way was I going to pay £350 odd to book us 4 middle seats in CW. So I called up and they allocated us the seats for free. 3 days before the flight. Very pleased with that as a lowly Blue jub too…. Good of BA to do that. Although at T-3 days they had probably already allocated seats for you which you would have seen at check in. Did you call up with the intention of asking about seats? or did they offer to do it when asking about another query. Called up to link the 2 bookings with intention of them hopefully giving us 4 together when we checked in. Maybe they had already allocated us the middle 4 though….. Sorry, I missed the fact it was two separate bookings. Good service! Mine were paid very timely a week or so after 6 months. Others reported similar things. I think this was back in January/early Feb.
OT – can anyone recommend the best seats in F for a couple on a 773 (BA). 1A/1K/2E/2F are taken, and otherwise all free. Seatguru seems to suggest 1E/1F aren’t the best. Is it best to go 4E/F? Or better just to not sit together and go A or K in different rows? Hoping to get some sleep but would also be nice to sit together as first ever F… Thanks for any tips. Don’t think it really matters in F. Obviously 1A/1K are the golden seats but It’s not like Club where every seat has big pro’s and cons. perhaps not the ones nearest to the galley and toilet though. The E/F pairs are all much of a muchness really. On the 777-300 the loos are at the back of the F cabin so I’d marginally favour Row 1 over Row 4. There really isn’t much difference between seats on the 777 though. We usually take a window seat, one in front of the other and use the buddy seat to eat together rather than a middle pair anyway. 1A/K are reserved for Golds until a couple of days before the flight so they may become available. 1A/K maybe the most private but they aren’t the best seats (due to cabin curve) Rows 2 / 3 are better. Random question but does a Corporate credit card affect my personal credit score? My company’s rolling out full-on enforcement of a non-Amex credit card which we all need to get…wondering if this will affect me negatively in any way. Corporate cards (including joint liability ones) do not appear on your credit report. O/T sitting in LGA currently , AA asking for volunteers to take later flight, intially offering $250 in flight credit now gone to $375 what are readers experiences and how much should I hold out for? Where is the flight to? I’ve heard of people getting a lot more than $375 depending on the length of the journey. and to make it worse, 5*400 EUR is 2000 EUR which is currently a lot closer to £1800 than £1500.